Slice off the fennel stems with the fronds. Then slice the tip of the root off. Take the knife and slice it down the middle of the bulb, and with a paring knife, slice out the core. Then thinly slice the fennel. Toss the fennel slices with 1 tablespoon oil and pinch of salt and pepper. Roast for 8 to 10 minutes, until tender. Remove from oven. In the meantime, rinse the mushrooms and slice them thinly. Heat the remaining oil in a large skillet over medium high. Add the mushrooms, the thyme leaves and a small pinch of salt and pepper. Sauté for two minutes, until slightly browned. Remove from heat. On a large floured work surface, roll out the Pillsbury™ dough. Using a small bowl, cut out 4 circles. Either save the remaining dough and roll out for another pizza, or freeze for later use. Lightly brush each circle with a little olive oil. Then sprinkle with mozzarella cheese. Top with sautéed mushrooms and roasted fennel. Top with a little more cheese and bake about 10 minutes, or until the cheese is brown and bubbly. Garnish with fresh rosemary and lavender blossoms. Serve immediately! I need you to stop whatever it is you're doing and make these pizzas. And then invite me over. You know how you make something to eat and it's like yum, good, fine, fuel, la dee da? All that changes right now. And I mean right.now.buddy.ole.pal.ole.chap.ole.friend. Second of all, sautéed mushrooms with thyme. Hellllllllllo. Third of all, pizza. The end. 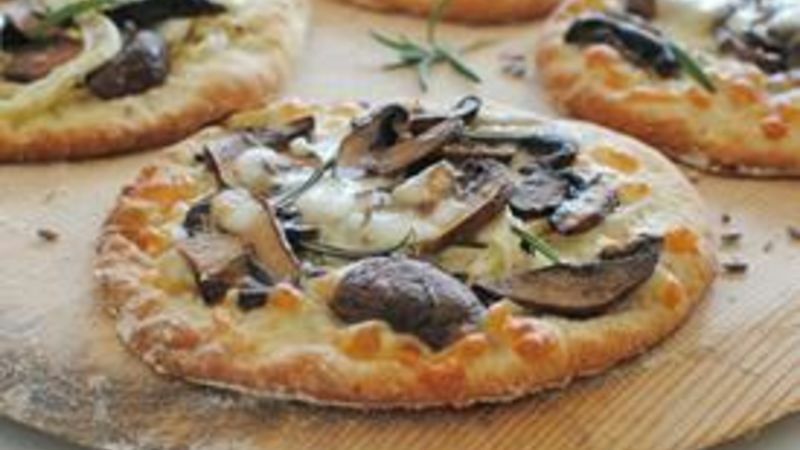 Grab some Pillsbury thin crust pizza dough, a fennel bulb, some mushrooms (I was going to use shiitake, but my store was out. waaaaaah. ), some shredded mozzarella, a little fresh thyme, rosemary and lavender blossoms! Okay, so the fennel bulb. First, just cut off the stems with the fronds on it. Then, slice the root end off. THEN, slice it down the middle, and cut out the little core parts. Like this. Thinly slice the fennel and toss it with some extra-virgin olive oil, and a good pinch of salt and pepper. Aaaand roast-a-rooni. Give yer shrooms a slice! Then toss them in a skillet with the thyme and oil until they start to brown and you want to melt in your own tears. Take the Pillsbury dough and roll it out. Using a bowl, cut out 4 mini circles. But not too mini because we love food. I mean, right? Lightly brush each crust with a little oil. Then top top top with cheese, mushrooms, fennel and more cheese. Mmmmm. My heart. My eyes. My breathing. I can't see. I'm telling you, that fresh rosemary and lavender blossoms just send this over the EDGE. Ugh! I basically can't stop crying. I'm not kidding. You better invite me over. For more musings, visit her blog Bev Cooks and her Tablespoon profile.